Are you looking for a new way to spice up chicken salad sandwiches? 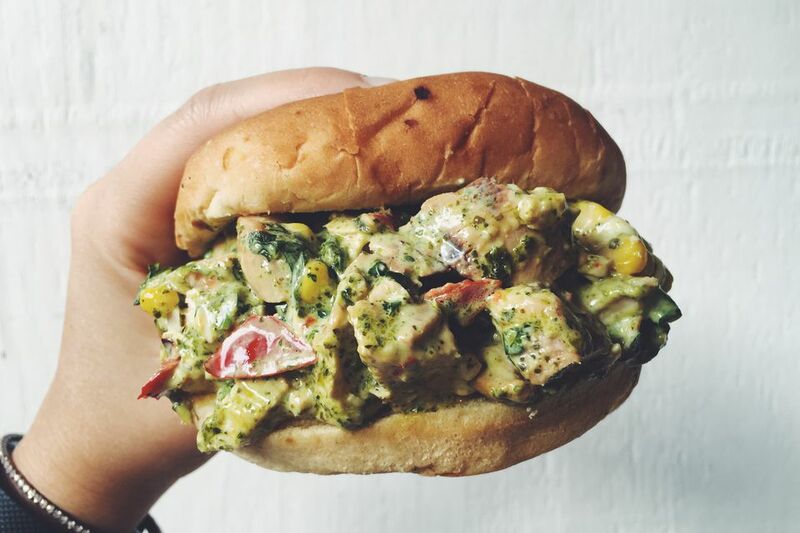 Try this mouthwatering version with smoked chicken breast, zesty chimichurri, fresh grilled corn, and peppadews. Add the chicken to a ziplock bag and add garlic salt and olive oil. Let it sit for at least two hours. Prepare the Big Green Egg® by placing a small handful of soaked cider wood chips and organic charcoal in the bottom of the Egg and light it with an Egg fire starter. Place the convEggtor with the legs facing up and add the metal grate. Close the Egg and try to regulate the heat around 340ºF. Do this by opening the top vent a half inch and adjusting the bottom vent so that a little over an inch is exposed. Watch your Egg for about an hour so that it has time to regulate without getting too hot. Add the chicken and let it smoke for about 30 minutes or until the internal temperature of 160ºF is reached. Remove from heat and let cool. Keep the Egg hot for the next phase of the recipe. Add mayo and the chimichurri to a medium-sized bowl and stir to combine. Add chopped chicken, grilled corn, and peppadews. Season with salt and lime to taste and set aside. Once the chicken salad has been prepared, simply toast the Cobblestone Bread Co.™ Toasted Onion Rolls on the EGG for a few minutes and fill each roll with half of the chicken salad. Serve.